Step 1 involves understanding that the executive behaves in different ways depending on the size of the jamaat. 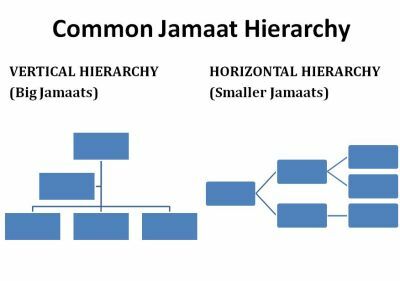 A bigger jamaat tends to have a vertical hierachy where decisions are top-heavy. Consultations occur less with grassroots and decisions are taken by appointed and elected executive members internally. 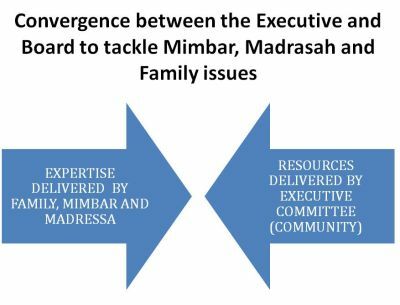 In smaller jamaats, however, the executive often works in direct conjuction with grassroots where there is a greater role for families to play a role in decision-making and there is often an informal reliance between members and the executive. This is described as a horizontal hierarchy. 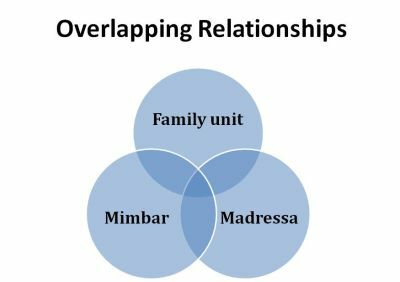 Step 2 involves contemplating over the overlapping relationships between the mimbar, madrasah and family unit. These units overlap in a variety of ways as each unit impacts the other through the issues they tackle and the way they intend to solve problems. For example, the status of parents which is discussed from the mimbar is a family issue and also a madrasah issue as children learn how to respect their parents at home and in madrasah lessons. 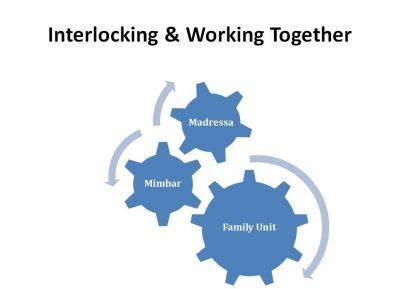 Step 3 shows in order to solve our variety of social, intellectual and ethical issues, the mimbar, madrasah and family units must work together closely and consistently. Otherwise our problem-solving methods are fragemented, narrow and not holistic in nature. 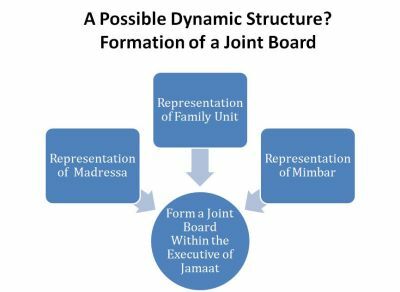 Step 4 presents a possible solution for the way in which the mimbar, madrasah and family unit can work together in jamaats. It proposes that a joint board be formed within executive committees of jamaats that is devoted to mimbar, madrasah and family issues. In this board, experts emerge who devote all their time in interlinking these units and solving, for example, family issues or intellectual challenges. Experts must be selected on the basis of their knowledge and experience and not for a particular ideological or intellectual view that satisfies executive committees. Otherwise, experts are appointed on a political basis rather than the skills they hold. Step 5 shows that there must be a good working relationship betweent the joint board and executive committee. Executive committees should respect the views of experts in the joint board but at the same time, the joint board must respect jamaat procedures. This enables decision-making, accountability and implementation to be shared. I humbly propose that the madrasah should be an 'Open Community University' that focuses on two key strands of educational development. The first is that the madrasah should be the base of intellectual and spiritual learning of youths as well as adults. It should be a place where all can attend at all learning levels. It should be interconnected to the mimbar and family unit to the extent that the madrasah does not merely become an isolated Saturday or Sunday school. Rather when an adult or young person listens to a lecture on the mimbar or is engaging with his/her family, he/she is constantly learning through a variety of mediums. The madrasah must provide a cohesive, interconnected educational vision for the whole community. The second strand of the Open Community University is to focus on the holistic nature of a human being. Human beings cannot only learn laws or engage in recitation – they are multi-dimensional creatures with ethics, emotions and desires. Accordingly, social ethics (not just in terms of personal development but in terms of social relationships), applied ethics (e.g medical ethics), theology, philosophy, tafsir, poetry and art need to be taught to students, at least at a foundational level. This will intellectually prepare them for the numerous ideologies which we find in a pluralistic and globalised society. It will also satisfy their thirst for answers and allow them to seek confidence in the institution of the madrasah, rather than outside of it. Here, we must target what we want students to become, how they should develop and what kind of intellectual and moral standards they should reach. Our failure here is perhaps best shown by our lack of attention to post-16 students who finish madrasah and lack of creativity in coming up with original educational techniques for teachers and students alike. We currently rely on teachers training, curriculum development, networking and sharing best practices as the means for our solutions. However, all of these methods only focus on external educational processes rather than the core, internal processes of coming up with a unique educational vision from the teachings of the Ahl al-Bayt (a.s) and developing spiritual techniques of learning. Overall, the two strands of the Open Community University can cohesively tackle the variety of marital, family, adult and youth issues that currently exist in our community. In total, there have been 11610 visitors (33289 hits) on this page!